Home › Blog › Blitz GT3-GBS 1/8th On-Road GT Body-Shell now available @ Quantum! 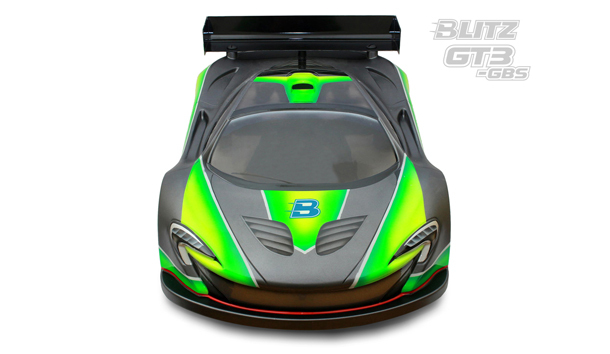 The new BLITZ GT3-GBS 1/8 GT body shell was a newly modified version of previous GT3 body. The GT3-GBS modified the height of engine hood and the depth of A-pillar in order to meet the latest IFMAR GBS body rule. The GT3-GBS body also modified the front bumper edge. The new bumper now is with more down force. It will result with more steering. The rear wheel arch surface was also extended. It not only increases the strength of the rear end, but also makes the body-shell able to move forward to increase steering. The standard version GT3-GBS body was built from 1.0mm high quality polycarbonate sheet, and the light version was with 0.8mm. Both versions include rear wing, wing screws, decal, and window mask for painting. Note: GT3-GBS Body-Shell is sold in clear unpainted.